In some ways, summer and staying organized seem to be on opposite ends of the spectrum. Summer means unscheduled days, spontaneity, and a generally more relaxed approach to life. On the other hand, being organized is often associated with schedules and rigidity. I propose we can have both…the fun and spontaneity of summer, with just the right amount of order that we don’t find ourselves facing a three-month clutter dig out come fall. Sound like a plan? Here are five ideas to try. 4. Call on your little helpers. The kids are out of school which means they’re probably creating more messes than they do during the school year. (More time at home simply means more opportunities for stuff to come out of storage and pile up on flat surfaces!) Make it part of your kids’ daily routine to pick up and put away items they use. Get them involved in your daily bed-time declutter, or work on having them put things away before they transition to a new activity. This is a terrific habit to work on over the summer because it will also serve you and your kids well during the school year. 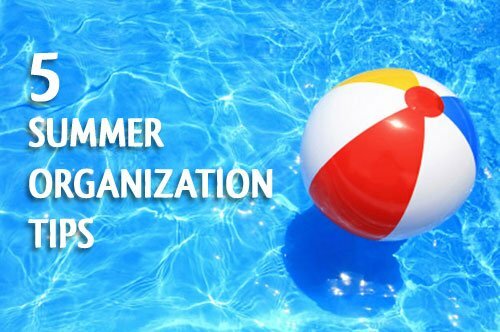 What strategies do you use to stay organized during the summer? I’d love to hear! Yes to all your tips! I also find myself re-writing my lists. If something has lingered on my to-do list for too long, a quick re-write helps me to focus and get back on track. Speaking of using little helpers’ hands: we always have the kids grab a small basket and go around the house each night before bathtime and grab any toys they’ve left out. By doing that each day, the mess never got too too bad and they got into a habit of picking up their own stuff! I find using a planner/ time management app helps in focusing on things that matters. I use Daily Notes to organize my life; kids, medical, projects, home etc. then add in my tasks, notes, even PDF attachments in each. It compartmentalises my life in these neat little folders, makes things easier for me to see what should be done for the day.